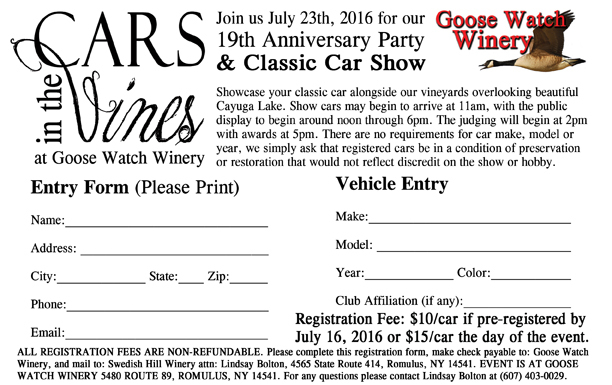 For the last few years our winery has featured a Classic Car show at our Anniversary celebration, and each year it continues to expand! We welcome you, your family, and your beautiful cars to join us for another festive day this July! With LIVE music, lawn games, local vendors, wine tasting & pairings, and of course the classic car show, it is a festive day to enjoy in one of the most picturesque settings along Cayuga Lake! Admission is FREE with food, wine, wine slushies, NA juice slushies, and wine tasting available for purchase. Feel free to bring a lawn chair to enjoy the music, help yourselves to a variety of fun lawn games, and peruse the tents of talented local artisans and sample delicious food from our vendors. The Romulus Volunteer Fire Department will also be present accepting gracious “boot” donations or try to win a Goose Watch wine basket to help their volunteer efforts! Take your time admiring the beautifully kept and restored cars and take part in voting for the 2016 “Fan Favorite”! Cost per car is $10 if pre-registered by July 16th or $15 per car the day of the show. Show cars may begin to arrive at 11am, with the public display to beginning around noon and going until 6pm. The judging will begin at 2pm with awards at 5pm. There are no requirements for car make, model or year, we simply ask that registered cars be in a condition of preservation or restoration that would not reflect discredit on the show or hobby. Trophies will be awarded in four categories, “Best of Show”, “Best Exterior”, “Best Engine” and “Fan Favorite”.